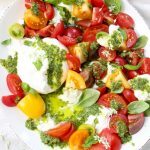 This Burrata Caprese salad recipe is for those days when you have the finest heirloom tomatoes sitting on the kitchen counter, but can’t decide between fresh mozzarella and ricotta cheese to pile them over. The struggle is real! 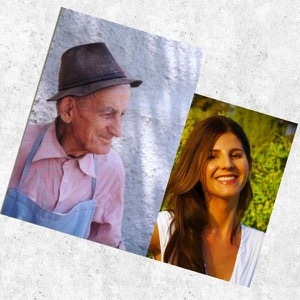 So you naturally reach for the finest soft cheese on the planet, right? 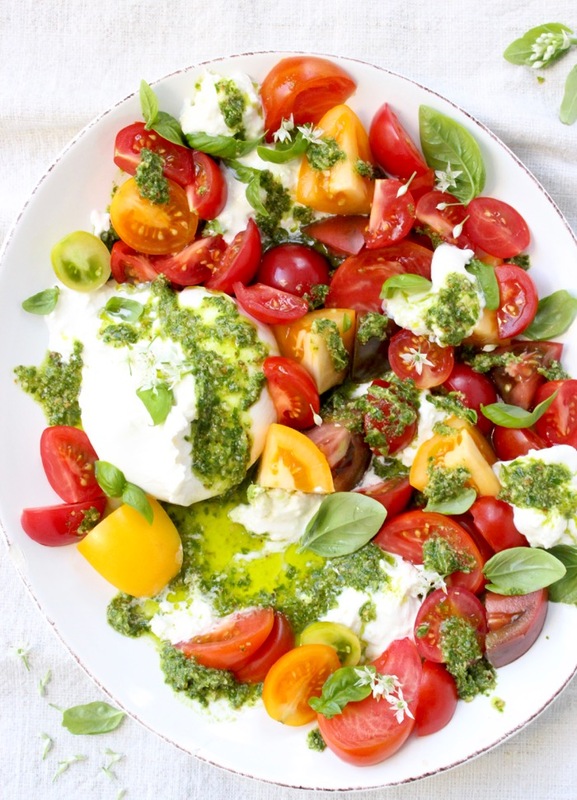 And you make a tomato burrata salad served over fresh basil pesto, like a boss! Because If you have perfect tomatoes, you most likely have a little bit too much fresh basil that needs to be used up today. So you also make a big batch of pesto and drizzle it over everything this week. Nothing goes to waste! 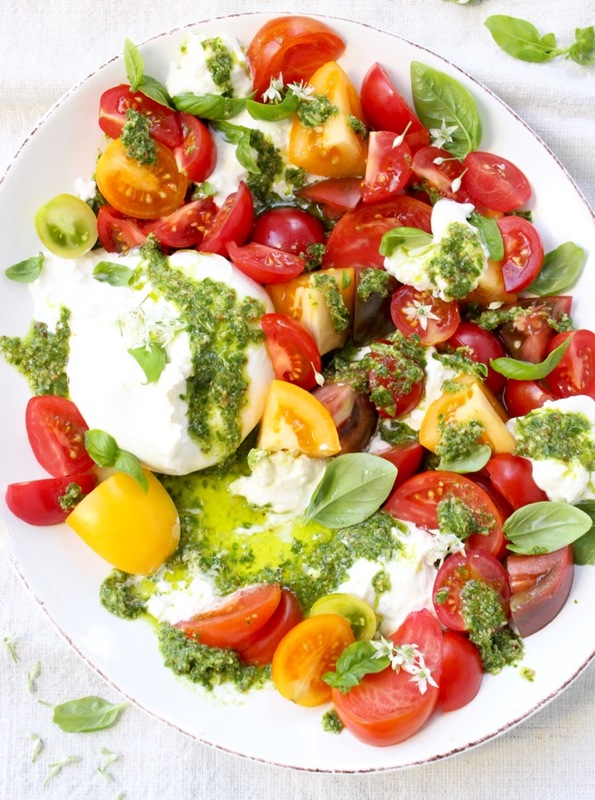 You make a tomato burrata salad, just like an Insalata Caprese, but better! 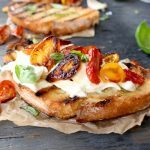 Because truth is: burrata wins over mozzarella you guys, it’s just the way it is! make some good pine nut or walnut basil pesto. 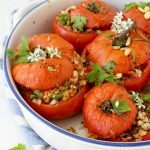 slice beautiful tomatoes into wedges and pile them over puddles of pesto. be generous with the burrata pouches. drizzle with more pesto on top. 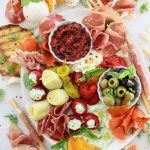 Now this is how you are supposed to use burrata cheese kids! 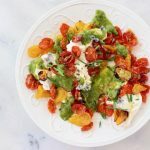 This Burrata Salad recipe is for those days when you have the finest heirloom tomatoes sitting on the kitchen counter, but can’t decide between fresh mozzarella and ricotta cheese to pile them over. Add the basil leaves, olive oil, pine nuts and lemon juice to the bowl of a food processor and make the pesto. Process until smooth to your liking. Transfer the pesto to a bowl and stir in the grated garlic and the parmigiano reggianno cheese. Season to taste with sea salt and add more lemon juice or olive oil to your desired consistency. Spread a layer of the pesto on top of a serving platter. Place the burrata cheese on top, carefully tearing the pouch with your hands. Slice the tomatoes into wedges and place them on top of the pesto and around the burrata cheese. Drizzle the burrata salad with more pesto, sprinkle with the fresh basil leaves and finish with a pinch of coarse sea salt. Is this something that should be served and eaten immediately? Or can you make it the night before? Hi Brooke! 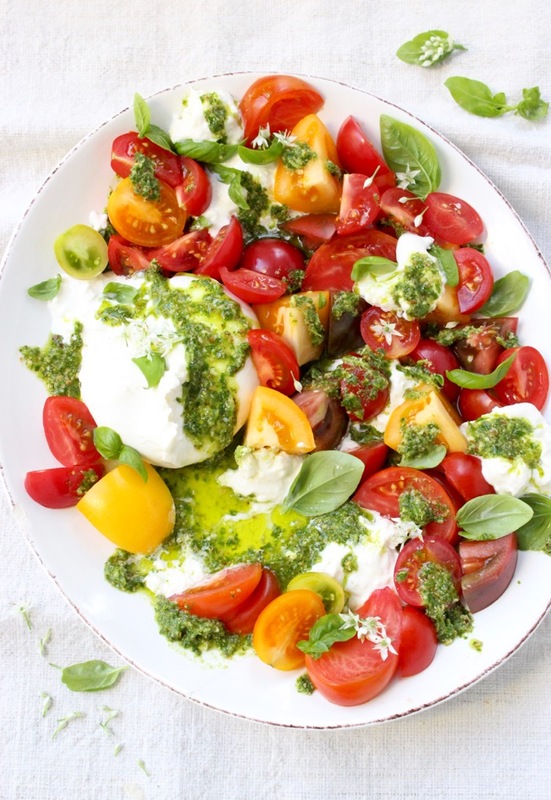 You can make the pesto in advance but I would definitely slice the tomatoes and burrata just before plating.